What I really liked about the Hop is that I got to visit five new-to-me stores. The metro area is so big and sprawling, it’s a bit of a drive to go to most places. We started at Zandy’s Yarn in Burnsville, went up to Needlework Unlimited in Minneapolis/Edina, west to Coldwater Collaborative in Excelsior, then north again to Amazing Threads (but we got a bit lost trying to find this shop), east to Sheepy Yarn Shoppe, and south to The Yarnery in St. Paul, and finally 3 Kittens Needle Arts in Mendota Heights. We left the house at about 9:30 AM and got home just after 4 PM! (Christy of Purling Away made a Google map that shows the shop locations.) Of these 7 stores, I’ve visited only The Yarnery and 3 Kittens previously. To prepare for the Hop, I researched each store’s website to see if I could find certain brands or items that interested me and might generally not be found at the other shops. I didn’t want to spend a lot of money or buy a ton of yarn, so I made a shopping list. I managed to stick to it pretty well; I found about half the items on my list, plus a few extra patterns. I set myself a budget and didn’t go over, so in all it was a successful excursion. Clockwise from top left: Cherry Tree Hill “Super Socks” and Sirdar 2029, a tweedy, cabled child’s cardigan. (I found these at Amazing Threads for half-price.) 3 Kittens “Puppy Bones Hat,” Knitting Pure & Simple “Neckdown V Neck Shaped Cardigan,” Oat Couture “North Shore Pullover” (another purchase of Mom’s), and the Dream in Color “Tulips” cardigan. On a related note, are there any readers out there who frequent Coldwater Collaborative? There was a shop display vest (the one on the left of a pair hanging high on the wall over the counter) that is awfully familiar. It looks to be worked in modular pieces, maybe triangles or hexagons. Do you recognize the piece I’m talking about? What design is it? Thanks! Update! Thanks everyone! Deb identified the piece as Lucy Neatby’s Equilateral Vest. Because I was participating in the Socks in the Cities KAL, I had a The Yarnery coupon for 15% off sock yarn, so I checked out the selection when we stopped there. I had a tough time deciding; nothing seemed right. Just as I was about to give up, Mom put this skein in my hands and after a moment of combined hesitation and resistance, I knew it had to come home with me. Pagewood Farm is totally new to me, so I was glad to have something new to try. I didn’t even notice until later that the yarn is a merino-bamboo blend. On my shopping list was a strickfingerhut or Norwegian knitting thimble. I’m still experimenting with different methods for holding the yarns for stranded knitting, and I wanted to try this. I like the new style Crystal Palace bamboo circulars, and needed one in this size. 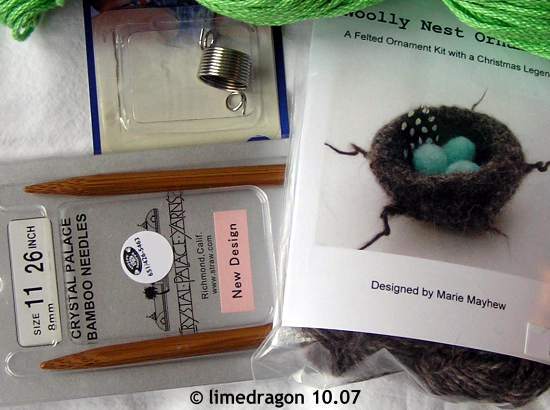 The Woolly Nest Ornament Kit is Mom’s purchase; she plans to make it for Grandma for Christmas. 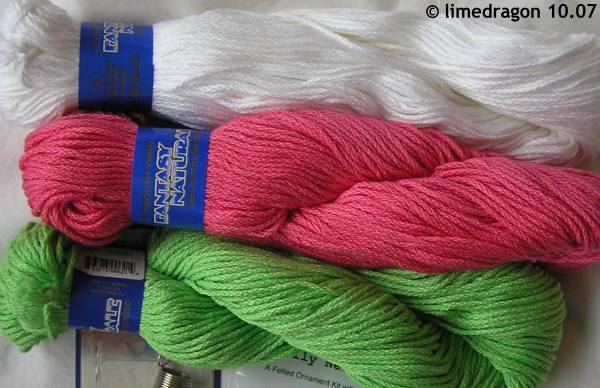 My last purchase was at 3 Kittens where I finally found some feltable wool in a color appropriate for a upcoming gift. 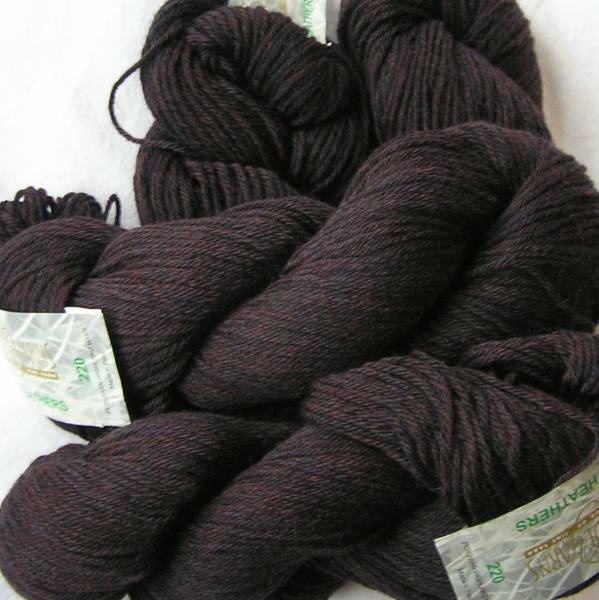 I love the name for this deep brownish-burgundy color, Galaxy (#4006). The feltable yarn is really pretty. Love that color. Deb over at Wound Too Tight would probably know that sweater/pattern. I think she used to work at Coldwater. Very cool haul! 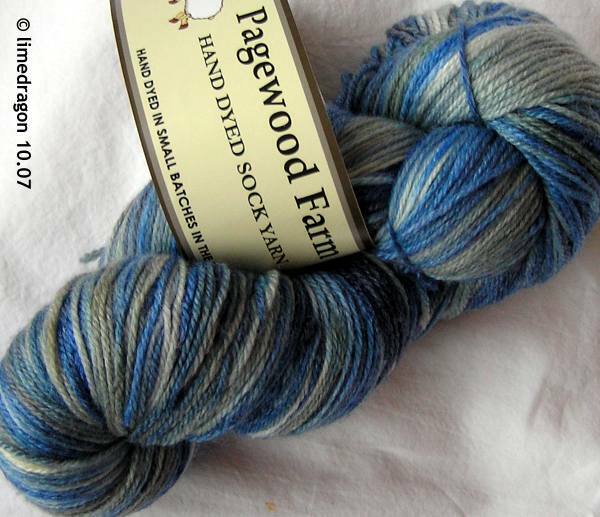 I like the Pagewood Farms yarn, different! Sounds like you had a great time! Now you need to make the pilgrimage out to the Yarn Garage in Rosemount, then you’ll have seen all the best stores. I really like Coldwater too. 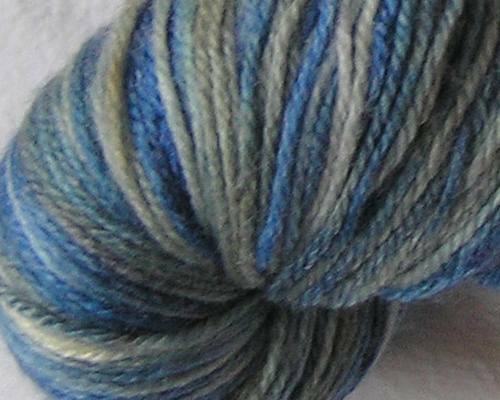 Oh, and Borealis, which isn’t on the Yarn Hop either. You were so organized! :) Isn’t AT in a weird location?! I guess not quite as weird as Yarnzilla, but close! You inspired me to start my Elegance socks yesterday. Thanks for pointing out that 3 Kittens has Cascade 220. I can’t believe I missed that! Did it look like it was made out of a Noro yarn – like Silk Garden perhaps? 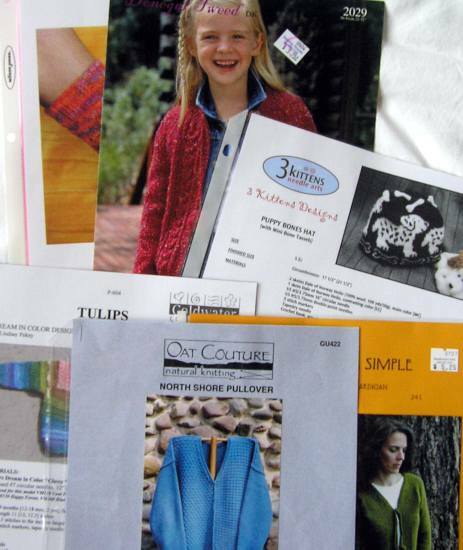 If it’s the one I’m thinking of, I have my friends at the store researching which pattern it is for you! Got it – it’s Lucy Neatby’s Equilateral Vest!! Excellent hop stash. I love the blues in that colorway. I love that Pagewood Farms yarn. Such smoky colors. Excellent shopping expedition! I like the colors in the Pagewood Farms yarn. It bet it makes some nice looking socks. Oh, I think I saw that vest. (before I got distracted by the adult sized version of the Tulip sweater). I think it’s one of Norah Gaughan’s – not sure if it’s in Knitting Nature or from a magazine, but it reminded me of her work. I’m coming to MN in late November and am actually going to be spending a few days in the cities this time around. Chris has told me I have to go to Depth of Field, which others would you put on the list of “Must Visit”? Which, if any carried spinning stuff that you noticed? Wow! Great haul. AT is in an odd location but at least you can clearly see it from the main road. It’s bigger than her first shop which was in Osseo. That place was so small and filled with si much you couldn’t move around. This location is much better. Sounds like a fun day. Wish I had made it this year! You made some great purchases! Coldwater is right up the way from me – it looks like you got your information – that is a great pattern. Very nice. It’s very clever of you to make a shopping list and sticked to the budget. Needlework is one of my favorite yarn store.